In contemplating his own professional development, Gawande researched instructional coaches—providers of job-embedded support—and found compelling evidence of the positive impact that coaching can have on growth in any industry. And recently, a group of researchers—Matthew Kraft and Dylan Hogan of Brown University and David Blazar of Harvard University—released a compelling study examining the impact of coaching on instruction and student achievement. Not surprisingly, they learned there is indeed a positive effect of one-on-one coaching on a teacher's instructional practice. 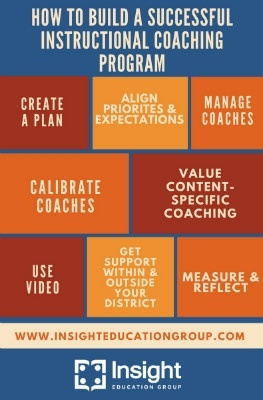 But before launching a coaching initiative as a principal, you need to have a thoughtful implementation plan in place. As coaching trainer Peter DeWitt laid out in his Education Week blog, 3 Reasons Instructional Coaching May Not Be Working, and as the Measures of Effective Teaching Project showed, coaching done poorly can actually hurt teachers’ performance. When evaluation mania swept across states several years ago, many leaders and policy makers focused on inter-rater reliability, but very few focused on the same calibration of the coaching sessions following these evaluations. Of course, delivering useful coaching is not simple. Many instructional coaching programs fail to yield real improvement in teaching and learning because they aren’t grounded in a strong, shared understanding of effective coaching and there are no mechanisms to “coach the coach” or to create a quality-control system. Too often, instructional coaching programs are implemented haphazardly, lacking a clear plan and common understanding of the purpose of coaching. Despite everyone’s best efforts, most school improvement initiatives in high-needs schools fail or show little improvement. The main reason for failure in strategic initiatives is the lack of execution. Unfortunately, good intentions are not enough when it comes to driving and sustaining growth—including when it comes to your coaching initiatives. As noted in a recent blog post on instructional leadership teams (ILTs), some of the greatest levers to improving student achievement lie in the school leader and an effective ILT. An ILT, sometimes called a school improvement team (SIT), a school leadership team (SLT), or a school management team (SMT), is vital to the success of any school-improvement initiative and can be the vehicle to devise, launch, and execute on improvement goals. An ILT can provide the process and quality control to ensure your coaching program succeeds. In our work with ILTs, we recommend that teams start the year by creating a simple planning document for setting a vision for all instructional initiatives and determining what it will take to achieve it. Our conception of vision is highly actionable—not simply broad aims or lofty goals. As you build the plan with your ILT, here are seven practical questions that you and your ILT can reflect upon together in order to give your coaching program the best possible chance of succeeding. 1) Are we connecting coaching to existing priorities, curricular programs, and instructional expectations to ensure alignment? Without deliberate attention to the dynamic environment in which it occurs, coaching can’t be effective. At best, failing to make this connection results in isolated support. At worst, it sends conflicting messages to teachers. As you work on your school plan, ensure that your coaching priorities align with your instructional and curricular priorities. Alignment between priorities will provide you with opportunities to measure your success and truly encourage growth. What is the instructional vision for your site? Is the staff committed to moving toward this vision? Do everyday instructional practices align with this vision? Are there specific coaching activities that could support the professional development initiative(s) at your site? 2) How many coaches are in our building, and who is coaching them? All too often, we see multiple coaches in a school building supporting the same set of teachers. In extreme cases, we’ve seen up to five coaches supporting a single teacher. While the quality of support provided by each coach may be terrific, the sheer quantity of advice and guidance is nearly impossible to synthesize and apply. Limiting the quantity and type of support provided and ensuring that coaches themselves understand each other’s roles in order to create a cohesive set of supports is critical for coaching efforts to be successful and efficient. This means someone needs to convene, manage, and coach the coaches themselves. We recognize this can be tricky, given that coaches may be deployed from multiple places (e.g. central office, new teacher support centers, building-level) but it’s absolutely worth figuring out how to solve the dilemma of managing and coaching multiple coaches in order to ensure overall success. 3) Are all our coaches—including instructional coaches and administrators—calibrated on what effective instruction looks like? As we explained in an Education Week article, Calibrating Coaches: 4 Reasons to Foster Great Instructional Coaching, in order for instructional coaching to be truly effective in promoting lasting growth, there must first be a clear and shared vision of what great coaching looks like among your coaches, including you as the instructional leader for the building. In many schools, it's not just coaches providing feedback, and therefore teachers receive mixed messages and inconsistent support as a result. Feedback that is calibrated around specific standards for coaching is more productive. When coaching processes become routine, teachers know that they can count on coaches for excellent support and the potential of each session to positively impact performance increases. A common characteristic among the highest-performing schools is that all initiatives and processes work together. When systems are aligned and implemented with fidelity, instructional coaching can support and build momentum towards the school's larger goals for teaching and learning. The ability to prioritize and focus on specific initiatives is a hallmark of effective school leaders. By ensuring that coaching works with existing efforts and towards a narrow set of shared goals, school leaders can strengthen existing initiatives instead of creating new ones. 4) Are our teachers being coached to be masters of their content and pedagogy? Instruction cannot truly be improved without regard to the content it covers. College- and career-readiness requires teachers to provide students with opportunities to apply their knowledge across disciplines and to the real world. It also demands that we prepare students to be problem-solvers who are reflective enough to know when a strategy is not working. We must teach them to seek information from multiple sources and assess that information for its validity. This approach absolutely requires teachers to be masters of their content. We have seen the value of content-specific coaching in our own work. In Newton County, Georgia, for example, after just six months of live and video-based coaching, the district's algebra proficiency rates increased at a rate five times greater than the state's average growth. 5) How can we use video to improve our teachers’ practice—as well as our own as leaders’? Speaking of video, we know that one of the most powerful tools in coaching is using video to film one’s practice. Athletes have been doing this for decades and simply can’t live without reviewing the “game tape” after a practice or game. As Harvard’s Best Foot Forward study demonstrated, video has several benefits, including providing a common piece of evidence in coaching relationships, providing more fair and productive observations, and increasing self-reflection. Video allows for “any time, any place, any pace” collaboration. While video has become an increasingly popular and powerful method for providing feedback to teachers, principals should also consider filming their own practice. With this in mind, consider filming your next coaching session with a teacher or an instructional coach. Then review it with your ILT, mentor, or a fellow principal in your network improvement community. You’ll be surprised at the areas where you’ll want to change. 6) As school leaders, how are we getting the support we need from our own coaches or mentors, as well as other leaders within and outside the district? As mentioned in an earlier blog post, principal coaches can play a critical role in supporting principals in this endeavor and can provide a perspective that helps to execute a successful coaching initiative in a school. 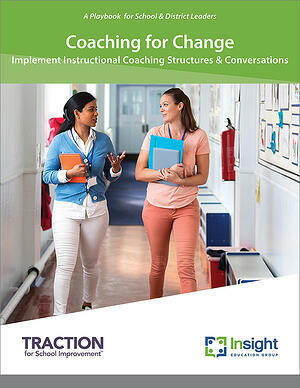 As an instructional leader, ask your coach to take a look at your coaching implementation. Reflect regularly together on what’s working and where there may things not going so well. Your coach or mentor can also provide you with insight about what’s working in other parts of your district. In addition to your coach or mentor, consider connecting with other principals in your district or nearby districts to form a networked improvement community (NIC), a broader network of peers for meaningful, job-specific collaboration that provides systemic pathways for effectiveness and successes to permeate across (not just within) schools. A NIC could provide you a way to solve the pain points you and your fellow principals are experiencing in your coaching endeavors, identify what is working that can be replicated and scaled, as well as gain support from one another. 7) How will we measure and reflect upon the success of our coaching initiative throughout the year? You have the opportunity and the responsibility to collect data and reflect on the impact of coaching activities. Impact is measured in relation to teacher satisfaction and performance, student achievement, and the collaborative culture of the school. Here are a few additional ways to consider helping to evaluate your coaching initiative. A. Measure your coaches’ coaching competencies. Insight has created three tools designed to help you reflect on your own personal coaching competencies. The first tool, The Competent Coach: Pre-Assessment, is designed for use prior to beginning a coaching initiative. This allows the coach to identify core competencies that may relate to his/her coaching responsibilities, and to identify ways to build the foundation for a successful coaching initiative. The second tool, The Competent Coach: Mid-Point/Post Assessment, can be used at any time during or after a coaching initiative to self-reflect on your effectiveness and your impact on teacher practice. Finally, the third tool, The Competent Coach: Stakeholder Survey, can be administered to school staff to gauge their perceptions of your effectiveness as a coach. We have aligned the questions in the Mid-Point/Post-Assessment to those in the Stakeholder Survey. This alignment will allow you to compare your own perception to those of your clients (e.g. the teachers and the principal), and to further reflect on how you can build on your strengths and improve your identified areas of need. This survey should be completed anonymously, in order to ensure candid and honest feedback. We suggest beginning with the Pre-Assessment prior to the coaching initiative, and then using the two other tools at the midpoint of the coaching initiative, and again at the end. It is also useful to present the survey findings to the teachers you have worked with and discuss how you will work to continuously improve and better address their needs. By modeling your own commitment to continuous learning, you can help establish your credibility and create a culture of continuous and purposeful learning throughout the school. B. Set up regular, whole-group check-ins with coaches. As part of your regular ILT meetings, set aside a regular time in each of your team meetings to have you and your coaches discuss trends you’re noticing among those you’re coaching, and to provide feedback and support to one another on challenges arising in specific cases. C. Have coaches observe the teachers they’re not coaching a couple times a year. This experience will not only provide the teachers with different and new perspectives, but also allow coaches to take fresh eyes to observe the areas identified by the teacher’s main coach to see if they are being addressed. As a principal, you have a lot of influence over whether your teachers stay or go; in fact, research says you are the single largest determining factor for retention or attrition. A strong coaching program is a key lever to improving student achievement, but also serves as a mechanism for retaining your effective staff and delivering on the promise of continuous professional growth. And let’s face it—positioning coaches to maximize their impact is the tricky part. As a principal, you play a key role in this and can help propel results from coaching efforts forward by regularly asking yourself the questions above. Above all, reach out for support. Seek out your principal coach or mentor and get that additional perspective you need to be a strong leader in your coaching initiative. Technical assistance providers also play a key role here. At Insight, we always ask potential partners these same questions before engaging in new relationships to help ensure that we are not compounding an existing problem—the problem of more—by adding another layer to confusing, diffuse efforts by multiple support providers. If you’re looking to set up an instructional coaching program or you’re looking for advice for growing your present one, send us a message and let’s set up a time to chat. 8 blueprints, or sequences that show how protocols can be used together to support typical coaching situations. As CEO and president of Insight respectively, Jason Stricker and Jason Culbertson bring extensive experience in educational leadership and instructional coaching. With extensive experience in education as a teacher, instructional coach, chief academic officer, consultant, and business leader, Jason Stricker brings to his work a deep understanding of educator effectiveness and organizational change and its impact on stakeholders at all levels. Jason Culbertson brings his experience as a former classroom teacher, leader for state and non-profit organizations, and thought partner for districts, states, and the US Department of Education to help solve the challenges of underperforming schools nationwide and abroad.